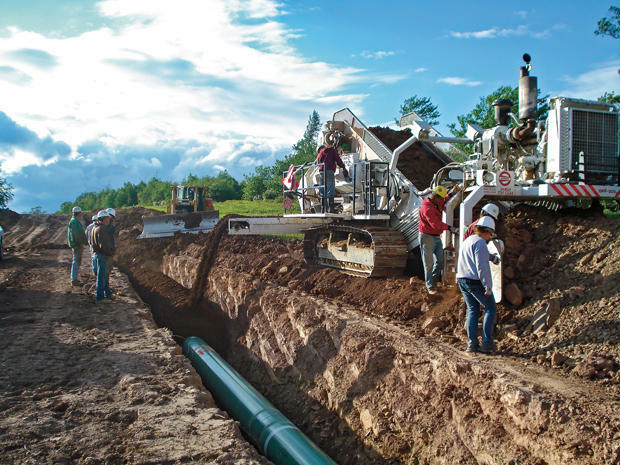 The Atlantic Coast Pipeline, a three state natural gas project connecting the Virginias and North Carolina, has a new route through the southeastern part of our state. Now, an informational meeting is set for March 29th for landowners to hear about the changes and how it may impact them. Jared Brumbaugh has more. The alternative route it is located farther from residential areas, as it parallels a Progress Energy Carolinas electric transmission line east of Fayetteville. Spokesperson for Duke Energy Tammie McGee. Although the new route impacts approximately 140 landowners and adds 1 and a half miles to the total length of the project, McGee says it will affect fewer bodies of water and impact a smaller number of landowners than the previous route. An informational open house meeting is set for March 29th in Cumberland County to notify stakeholders of the changes. A time and location for the meeting has not been announced. The new route has been adopted, but won’t be finalized until a certificate is received from the Federal Energy Regulatory Commission.